Bonjour mes amis! This post is my third installment in collaboration with the amazing Caviar Noir Jewelry (see the popular predecessors here: 1. Kashmir and 2. Angelique), featuring the one and only Moroccan finger bracelet and a complementary nail design to go with today's overall Islamic theme. Islamic-style jewelry is my absolute favorite. There's just something so exotic and captivating about bold turquoise, intricate motifs and jingling precious metals when they're assembled together in one piece of jewelry. Islamic-style accessories not only adorn, but flatter every movement of the hand, sway of the neck and rhythmic shimmie of the body. Always feminine and glamorous, these pieces add a touch of Eastern sensibility to any dress ensemble and never go out of style! The Moroccan Bracelet Ring (Bring) by Caviar Noir was inspired by the exotic air of Morocco and Marrakech, and in turn, inspired me to create a nail design to fit the bracelet and the theme! Confession: I own a 10 pound bag of Islamic Jewelry and Islamic-style accessories and I honestly can't get enough... Every time I see it glisten or hear it jingle, it hypnotizes me like a snake charmer's flute to a cobra!! "Border-Nails" is my new favorite trend in Nail Art and Design. I was waiting for the right moment to try these out for myself and today's occasion couldn't be more fitting! I used contrasting colors to keep the design true to the original, and added a simple Islamic motif to my accent nail. Apply your border color (Teal) all over the nail on top of your base coat and wait for it to dry. Apply your center color (Beige) as you would normally, but avoid the border (2mm) on the bottom and sides of the nail bed. Make sure this polish is opaque and/or apply two coats if necessary. Wait for it to dry. Using the border color (Teal) add a rounded french tip to seal the "border" and wait for the polish to dry. Finish the manicure with a top coat. Using a striping brush, paint a thin border around the base and sides of the nail using Teal. Apply your center color to the bare part of the nail to perfect the edge of the border and wait for it to dry. Side Note: Sinful Colors Cetus isn't as opaque as I'd like it to be, so I chose this way to compensate for the opacity of the polish. Enclose the border by painting a rounded French Tip using Teal. Finish the manicure with a top coat. Apply your center color (Beige) all over your nail on top of your base coat and wait for it to dry. Using a striping brush, paint a thin border around the nail using a contrasting color (Teal) and finish the manicure with a top coat once the border is dry. 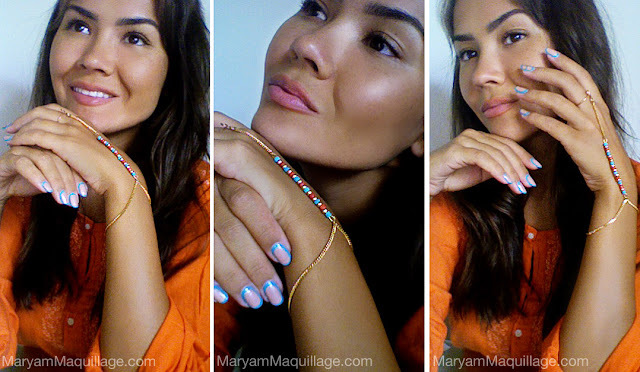 Modeling Caviar Noir's Moroccan Finger Bracelet and my Islamic-inspired Border Nails!! Are you feeling this trend? so talented babe, love it. So creative and beautiful, i am really in love with all your creations ! This is amazing!!! I must try this out! Heart you girly!! May you be blessed with a life of fulfilment. Very pretty! I love the bracelet ring. So beautiful! That piece of jewelry is so pretty! I LOVE that nail technique. I tried it a while ago and got tons of compliments. Wow girl, you totally NAILed it! Ahahahah =P Seriously, I'm not sure I'll have enough patience to try this one day! Saw this on Pinterest- absolutely beautiful!! very nice mani!! & love the bracelet/ring!! I used to have one of those when I was younger!! me too!!! There's just something so feminine about it :)) Thanks Sara!! This mani looks pretty! Love the colors you used! you and your nails so beautyfil! I don't know if there's a right way, but the hardest way is probably the classic... Thank you doll!! beautiful! love those colors together, and that bracelet is just fabulous! I love the nail design, but even more I love that piece of jewellery. It just looks so sensual, but also really fun and perfect for summer against tanned skin. Absolute perfection, you never cease to amaze me with your percision! <3 As always, thank you so much for giving us the how-to on this nail look. xD I never would have figured it out. I'm a complete failure at it.